NEW YORK — The U.S. ambassador to the U.N. has pledged to continue to inplead the case of an American pastor imprisoned in Iran when she appears before the United Nations. 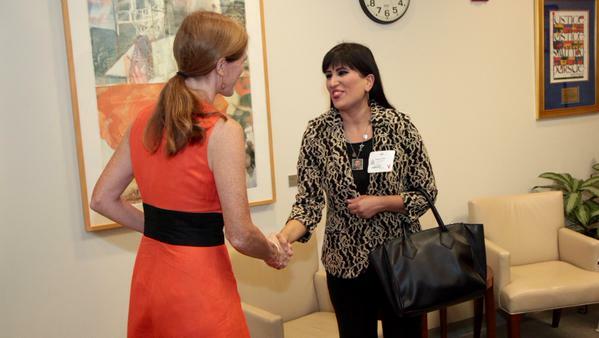 Samantha Power met with the wife of Pastor Saeed Abedini on Friday at the U.S. Mission in New York City. Abedini was later charged with threatening the national security of Iran, and for attempting to turn youth in the nation away from Islam and toward Christianity. He was then sentenced to eight years in Iran’s notorious Evin Prison, but was transferred to to Rajai Shahr Prison in 2013, which was believed to pose an even greater threat to Abedini’s health and safety. He has reportedly experienced numerous brutal beatings behind bars from both the prison guards and his fellow cell mates. Abedini’s wife, Naghmeh, has been urging the American government to push for his release, speaking before Congressional committees and meeting with Barack Obama and other members of his administration. This week, in attending the International Panel of Parliamentarians for Freedom of Religion or Belief, Naghmeh asked to meet with Power, and was granted 30 minutes of her time. Power also Tweeted about the matter, pledging to continue to work to help free the pastor. Abedini also notes that on Thursday, she encountered Iran’s Ayatollah Mohaghegh Damad and was able to speak to him about her husband. Abedini says that she is “sensing a new boldness rising up … in proclaiming the name of Jesus” as she pleads for her husband’s release. On Saturday, she spoke before 100 parliament members from 50 countries, many of which are Muslim. September 26 marks three years that Saeed Abedini has spent behind bars.